Wilds: Slice & Dice is a new moba game released by PigBang/AI GAMES FZ for Android and iOS devices. 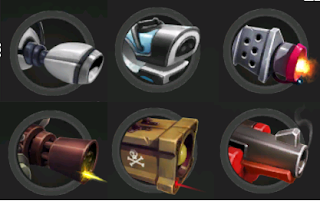 Learn these three tips and you'll be ready on what abilities, weapons, towers does ingame. Wilds: Slice & Dice Tip #1: Abilities. Abilities are special attacks, shields, buffs, de-buffs and banners that you can use in combat for more effective ﬁghting. You'll need energy for most abilities. Energy is a substance used for most abilities. A player gains energy when attacking enemies with a weapon, or when attacked by enemies. Energy is lost overtime when not attacking enemies. Cryo Grenade: Slows enemies and stuns them for a short period of time. EMP Grenade: Disables enemy weapons and towers. Immunity: Makes you immune to negative effects and eliminates them. Banner of Damage: A banner that increases ally damage in an area. Banner of Defence: A banner that increases ally defence in an area. Banner of Slowdown: A banner that slows enemies in an area. Berserk: You will gain speed while dealing and receiving more damage. Blink: Immediately relocates you to another place a short distance away. Charge: Makes a sudden dash forward, damages and stuns an enemy he runs into. Corrosion Grenade: Increases the damage dealt to enemies and weakens their attacks. Flame Grenade: Cause fire damage and sets the ground on fire for a period of time. Haste: Increases the speed of you and your nearby allies. Heal: Provides healing to you and your nearby allies. Poison Grenade: Poisons enemies. The poison intoxicates nearby allies of the infected enemy. Power: Increases weapon damage for you and nearby allies. Reflect Damage: Creates an energy shield that reflects a portion of incoming damage back to the attacker. Shield: Creates an energy shield that absorbs a portion of incoming damage. Stun: Throws back and stuns enemies. Teleport to Base: Teleports you back to the base. Wall: Creates a wall that blocks the way. Warp Grenade: Creates a singularity that absorbs all nearby objects. Wilds: Slice & Dice Tip #2: Weapons. You can improve weapons in the Armory. 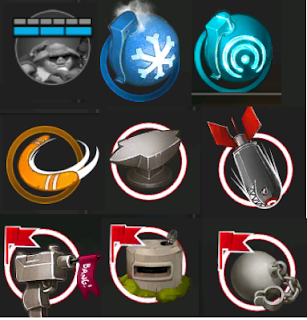 Choose the weapon that you would like to improve, and then click the "Calibrate" Button. Flamethrower: Causes great aerial damage at a short distance. Sets enemies on fire. Slows your movement speed when equipped. Machine Gun: Causes great damage at a medium distance. Slows your movement speed when equipped. Rocket launcher: Cause medium aerial damage at a long distance. Slows your movement speed when equipped. Shotgun: Causes great damage at a short distance. SMG: Causes medium damage at a long distance. Sword: Causes great damage to multiple targets at a short distance. You can insert temporary weapon perks into your weapon. Weapon perks are basically different elemental effects. Bleeding: Bullets and stabs can cause bleeding. Corrosion: Bullets and stabs can cause infection. Enemies receive more damage while infected. Critical Damage: Bullets and stabs can cause critical damage. Explosion: Bullets and stabs can cause an explosion. Fire: Bullets and stabs can set enemies on fire. Freeze: Bullets and stabs can freeze enemies. Kickback: Bullets and stabs can throw enemies back. Poison: Bullets and stabs can poison enemies. Stun: Bullets and stabs can stun enemies. Vampirism: Bullets and stabs can steal life from the enemy and give it to you. Wilds: Slice & Dice Tip #3: Towers. Towers can be purchased with gold and constructed on ally-owned territory. Antiair Tower: Attacks one air target. 20 gold. Flame Tower: Attacks several ground targets. Sets enemies on fire. Causes more damage to biological enemies. 36 gold. Machine Gun Tower: Attacks one ground target. 20 gold. Rocket Tower: Attacks both ground and air targets. Causes areal damage. 54 gold. Tesla Tower: Attacks several ground targets. Cause more damage to mechanical units. 42 gold. Redeem Promo Code: WILDSCBT (Limited Time Only).